Once we'd got the keel inside it was a matter of lining it up exactly so we could get the 8 bolts in. Then it was back on with the keel box which surrounds the keel and stops the water from coming in. So, about three hours later all was sorted. 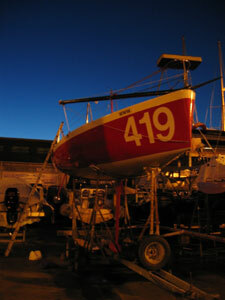 Next on the list is finishing off a bit of anti-fouling. The final big task on the list is to get the mast in. Hopefully that will happen next Friday and then I can get down to the business of learning the boat.